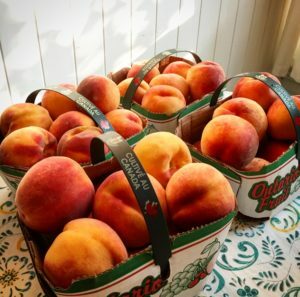 Canned peaches can be eaten just as they are, or used in recipes that call for fresh ripe peaches. Try to get high-quality fruit at peak ripeness for best results. 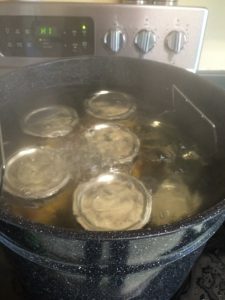 People always make canning seem super-difficult and complicated and time-consuming, but in fact it’s mostly washing things and cutting up fruit or vegetables. Don’t be afraid – just make sure your work area is clean, wash everything well, and follow the instructions below! I’ve added some notes at the bottom from my first experience canning peaches; they’re as much for myself as anyone else, but you may find them helpful! Prep time: It really depends on how fast you work, but maybe an hour to clean, peel, and cut up the peaches? Peaches are a high-acidity fruit, so technically speaking you can can them in plain water or fruit juice (please double-check this before trying! ), but adding a sugar syrup improves colour and taste. I used the water that I had blanched my peaches in, as I had cleaned the fruit thoroughly beforehand and didn’t want to waste the flavour/colour that remained in it once the peaches were removed. Wash jars and lids in hot, soapy water. Rinse well and air dry. Wash peaches thoroughly in water. Slice peaches as desired, removing any bruised, brown, or mushy areas. Bring sugar syrup to a boil, then reduce to simmer. Add sliced peaches to sugar mixture and simmer for 5 minutes. 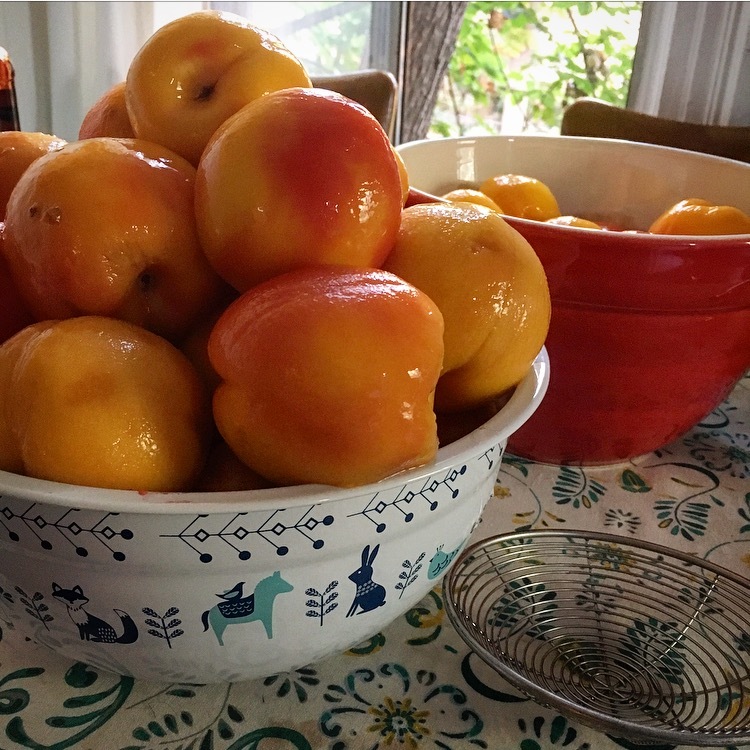 You can work in batches if the volume of peaches is too large for the pot. 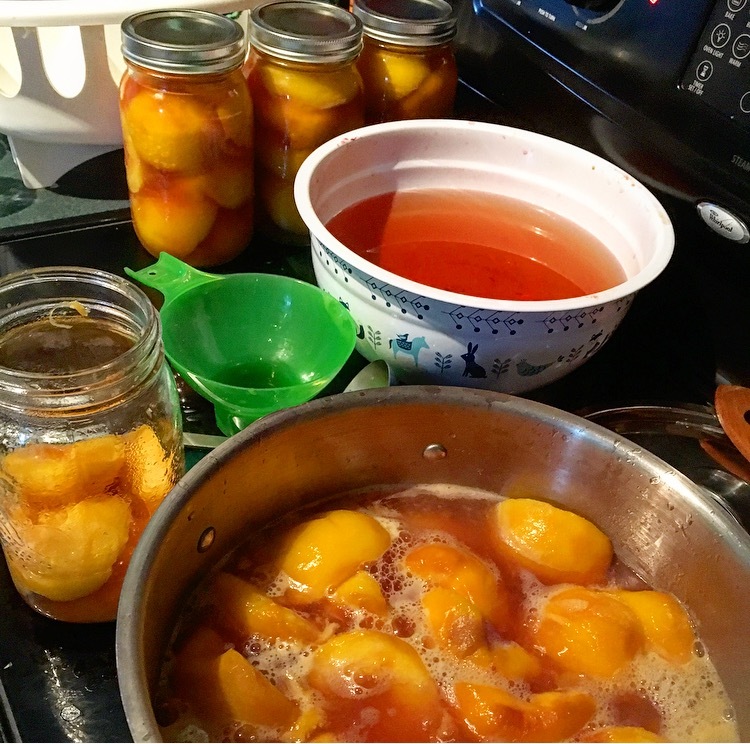 Using a slotted spoon, pack the hot peaches into the clean jars. Using a rubber spatula or similar, remove air bubbles by running it around the edges of the jar, occasionally pressing inward against the fruit. Place in boiling water bath, ensuring at least 1 inch of water above the tops of the lids. Bring water back to a boil. Process the jars of fruit in a boiling water bath for 25 minutes (if you’re more than 1000 feet above sea level, water bath times are longer! Look them up online before starting). Store jars in a cool, dark place until you’re ready to use them. Check occasionally to ensure that the screw bands aren’t rusting – this can cause the seal to break. Fruit in sealed jars may change colour over time, turning blue, pink, or red, or it may darken if it is not covered by the sugar syrup. This is a normal chemical reaction that does not indicate spoilage. **Re: Step 3 – I left the peaches in the boiling water too long (many minutes), and it cooked them a bit, which made them soft and hard to cut. You really should just immerse them quickly (seconds) and then douse them in the ice water. Also, it’s worthwhile to buy a bag or two of ice – I had to re-ice the water several times. ** Re: Step 4 – This can be a bit tricky with really ripe fruit, especially once the peach skins are removed. Sometimes I slice the fruit into quarters before trying to pry them apart, or use a thumb instead of the knife. 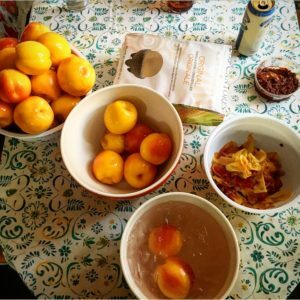 I pulped a lot of peaches before I got the technique right – and even then, it didn’t always work. ** Re: Step 6 – I ended up with a lot more syrup than I had anticipated, and so I’ve frozen it for future use. I could re-use it to can more peaches, or possibly for something else – we’ll see. But I’d hate to waste it! **Re: Step 10 – With the last bit of fruit, I spooned 1-2 tablespoons of Madeira (not that good) or spiced rum (really good!) into 3 350mL jars and filled those with fruit and the sugar syrup. I sometimes use the end of a batch to experiment with different option and flavours. You can also add herbs or spices to peaches – I’ve heard that fresh sprigs of thyme are a nice addition. 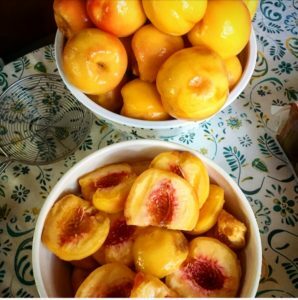 How was the flavor of the peaches with the Madeira? It wasn’t that special, and now I have a bottle full of Madeira that I don’t know what to do with. But I tried another batch with spiced rum (Sailor Jerry’s), and that was really delicious!